Children of the Mind is the fourth and final novel in Orson Scott Card’s Ender Quartet. This series begins with the well-known Ender’s Game, which tells the story of a young boy recruited and trained to be part of the International Fleet seeking to destroy the alien “buggers” that are a threat to Earth. The series was originally supposed to be a trilogy, with this novel initially being the second half of the third book, Xenocide. This final installment attempts to wrap up all loose ends in that have been woven and tangled throughout the series as the repercussions of Ender’s involvement in the universe finally take their course. – Everyone is arguing. Ender and Novinha. Jane and Miro. Miro and Val. Miro and his entire family. (Miro is very angry, clearly.) Peter and Si Wang-Mu. The list goes on and on. After a while all of these arguments start to sound petty and unimportant when everyone is actually supposed to be saving the universe. – I’m still not entirely sure what happened at the end. Rather than going out with a bang, this series ends with a confusing firework of random events. I was hoping for some clarity and closure, but no such luck. It’s not fun to write negative reviews of books you expected to enjoy, but sometimes it has to be done. I highly recommend the first three books in the Ender Quartet (Ender’s Game, Speaker for the Dead, and Xenocide) but Children of the Mind is an optional read as far as I’m concerned. 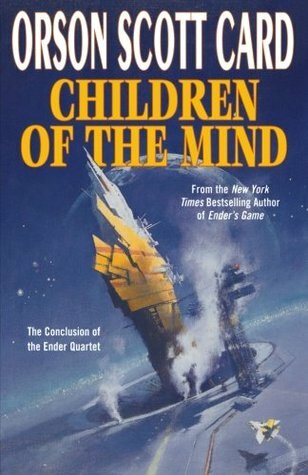 What are your thoughts on Children of the Mind or any of the books in the Ender Quartet? Would you recommend continuing on with books in the Ender series? How do you deal with disappointing books? Let me know in the comments section below! Next > Feminist Fridays: I wrote an entire essay about hair? I remember liking how everything wrapped up, but it’s been years since I read it. What about the ending confused you? I felt as though it was very rushed and abrupt… after all that build up over the course of the series!